The island of Bahrain has been ruled since 1783 by the Alkhalifa family who originated in central Arabia. They were renowned for the quality, fearlessness, speed and stamina of their war horses. In Bahrain since 1783, the year of the conquest, the Royal Family have carefully bred according to traditional Bedouin customs to keep the absolute purity of their Asil horses. Bahrain's Royal Studs have more pure strain Arabian horse families than anywhere else in the world. Because these horses have never been bred commercially, changing fashions have never dictated their breeding programme, which has endured since the time of the great conquests of the Arab nations in the 7th and 8th centuries AD. At Pearl Island Arabians we have pure horses from three of Bahrain's Asil Arabian horse families: the family Al Kray, Al Hamdanieh and Al Shuwaimeh. You can see them in Our Asil Horses page. Speckled Jellaby Stallion pictured here at 34 years of age. "The Kray strain is now believed to have vanished completely, except in Bahrain where it has been considered as precious as a family heirloom. It often happened that a horse was named after its master and in that way a new strain was born, but rare was the occasion that a man was called after his horse as in the case of the Kray. In one of the battles fought on horseback in East Riffa, one of the members of the Alkhalifa family (Sheikh Mohammed) was mounted upon a Kray mare. She had been both fierce and brave so her opponents tried to eliminate her from the battle; they eventually succeeded. When she fell, her rider, Sheikh Mohammed, fell with her and was trapped underneath with a broken leg. Thus he became an easy target and was killed by his adversaries. 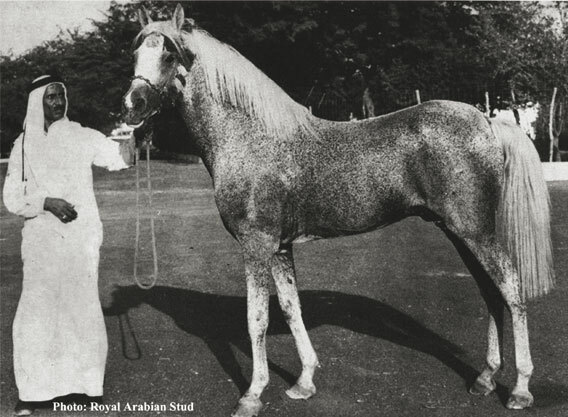 Even today the descendents of this particular Sheikh are identified in the manner Sheikh Ali bin Ahmed bin Abdullah bin Ahmed bin Mohammed, Master of Kray"
The Kray horses which are unique to Bahrain are known to be very courageous with a great deal of stamina. The Al Shuwaimeh family is described by Dr. Saeed Abdullah Mohammed (University of Bahrain): "This strain is one of the original five horses of The Legend (Al Khamsa) and therefore it is considered as a seperate line. They are characterised by strength and stamina. The name came from the [birthmarks] found upon the body. The strain has been present in Bahrain for a long time and receives special attention at the Amiri Stud." The Hamdanieh family has been bred in Bahrain for generations. It is also the strain most favoured by the Al Saud family.